Native to Ethiopia, the Arabian Peninsula, and Somalia, Myrrh has had spiritual significance since ancient times it became familiar to the West through the biblical story of the Three Wise Men (Magi). It was used in Egypt for embalming the bodies of Pharaohs myrrh was traded throughout the Middle East and even unto to China where it was used for making incense. The use of myrrh medicinally was recorded in China in AD 600 during the Tang Dynasty. Greek soldiers took a phial of Myrrh oil with them into battle, to stop bleeding wounds. The ancient Egyptians used myrrh in embalming compounds and burned pellets of myrrh to repel fleas. During the time of the Egyptian pharaoh Thutmose III, around the 15thc BC., the pharaoh’s aunt, Queen Hatshepsut, sent an expedition to Africa and the “Land of Punt” where myrrh trees were abundant. The Queen wanted to please the god Amun by surrounding his temple with living myrrh trees. The mission was successful and the story of the expedition was depicted on the walls of the temple built to enclose the Queen’s tomb. According to legend Queen Hatshepsut was promised “life, stability and satisfaction forever” by the well-pleased god, and the revered myrrh tree was introduced to the Egyptian people. The name ‘myrrh’ is Arabic meaning ‘bitter’ in English and is known as Mulmul, didin, Murra (Somali), it is a member of the Burseraceae family of the Plant Kingdom which has Consisting of 18 genera and 540 species. The tree protects soil in wind erosion prone areas. The gray trunk is thick with ducts in the bark. The bark peels in papery flakes from the greener under-bark. The main branches are knotted with smaller branches protruding at a right angle and ending in sharp spines. The hairless, roughly toothed leaves are divided into one pair of small, oval leaflets with a larger, terminal leaflet. The yellow-red flowers grow on stalks in an elongated and branching cluster. The small brown fruit is oval, tapering to a point. It flows as a pale yellow liquid, but hardens to a reddish-brown mass, being found in commerce in tears of many sizes, the average being that of a walnut. The surface is rough and powdered, and the pieces are brittle, with a granular fracture, semi-transparent, oily, and often show whitish marks. The odour and taste are aromatic, the latter also acrid and bitter. It is inflammable, but burns feebly. 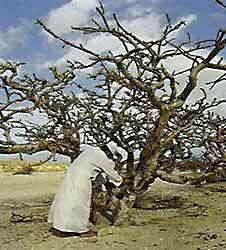 Myrrh resin is tapped from the tree. The milky liquid hardens on exposure to air into droplets or “tears,” which are then easily detached by the collector about two weeks later. New tappings are made at the same place as old ones after removing hardened resin from the previous cut. The resin is stored for about 12 weeks to harden. The only processing undertaken after collection is sorting and grading of the resin globules, usually done by the local merchant to whom it is sold rather than the collector. Myrrh is available in capsule, powder, and tincture form. It is pulverized into powder, and prepared as a tincture. It is found combined with other ingredients in dental powders, mouthwash preparations, and toothpaste. Myrrh is used as fragrance in cosmetics, perfumes, and soaps, and as flavouring in foods. Adulterations are not easily detected in the powder, so that it is better purchased in mass, when small stones, senegal gum, chestnuts, pieces of bdellium, or of a brownish resin called ‘false myrrh,’ may be sorted out with little difficulty. The essential oil is yellow – amber colour and sweet to smell, with a metallic tinge, however watch out for substitutes. It can often be found adulterated with opoponax (also known as Bisabol, sweet myrrh), a natural resin used as a fixative in expensive perfumery, and beer flavouring. At home, the oil should be stored like all oils in a dark glass bottle and kept away from direct light in a cool place to protect the oil from deteriorating. Curzarene, furanodiene, furanodiene-6-one and metyhoxyfuranoguaia-9-ene-8-one have been found to have antibacterial, antifungal, analgesic and local anaesthetic effects. Unfortunately the experiments were carried out on lab rats and mice. In the American Journal of Tropical Medicine and Hygiene a study carried out by Sheir Z , Nasr AA , Massoud A in Egypt involved 204 patients ranging from 12 to 68 years of age with schiostomiasis. “Twenty healthy subjects were also followed as controls. The infected patients were divided into 1 of 2 groups: those with schistosomal colitis or those with compensated or decompensated hepatosplenic schistosomiasis. All patients and controls received a formulation of myrrh at a dose of 10 mg/kg/day for 3 consecutive days on a empty stomach 1 hour before breakfast. After 2 months, patients who still had evidence of ova received another course of myrrh for 6 days. The overall cure rate was 91% for all infected patients. The cure rates for patients with schistosomal colitis, compensated hepatosplenic schistosomiasis, and decompensated hepatosplenic schistosomiasis were 90%, 94%, and 90%, respectively. For 12 patients who had never received treatment with praziquantel, the cure rate associated with myrrh was 100%. Patients with liver dysfunction experienced a lower cure rate, but it was not statistically significant”. As an anti-inflammatory and anti-bacterial myrrh oil relieves inflammation of the mouth and gums, and as a mouth rinse to prevent gum disease. As an astringent Myrrh Essential Oil strengthens the hold of gums on teeth, contracts the skin, muscles, intestines and other internal organs. It also strengthens the grip of scalp on hair roots, thereby preventing hair loss. It can also stops hemorrhaging making the blood vessels contract. As a diaphoretic it increases perspiration thus releasing toxins, excess salt and water. As an expectorant it fights the viral infections that can cause coughs and colds, as well as reduce the deposition of phlegm in the lungs and respiratory tracts. As an immune booster Myrrh oil strengthens and activates the immune system and keeps the body protected from infections. As a sedative induces calm, relieves nervous stress and anxiety. It also gives a happy feeling in cases of anger or sadness. As a stimulant it stimulates thoughts, blood circulation, digestion, secretions, nervous activity and excretion. It stimulates the pumping action of the heart, the secretion of digestive juices and bile into the stomach, and it keeps you alert and active by stimulating the brain and the nervous system. As a vasodilator it stimulates blood circulation and ensures the proper supply of oxygen to the tissues. Taken internally in tincture or capsule form, myrrh is a beneficial treatment for loose teeth, gingivitis, and bad breath. The tincture may also be applied directly to a tooth to relieve tooth ache. It is antifungal, and has been used to treat athlete’s foot and candida. Some research indicates that myrrh is effective in reducing cholesterol levels. It is a tonic remedy said to relax smooth muscles, increase peristaltic action, and stimulate gastric secretions. The myrrh resin has antimicrobial properties and acts to stimulate macrophage activity in the blood stream. The herb is being studied for its potential as an anticancer medication. For glossary see It All Makes Good Scents! The oil can only be used for external use, though some traditions have specific applications for internal use. It is preferable to dilute it in a Carrier Oils at 3 drops per tablespoon. Oral – relieves toothache, gingivitis, and mouth ulcers, and freshens the breath. It All Makes Good Scents!